Being a misfit does not disqualify you from a dynamic life--it prepares you for it. Matthew Barnett knows a thing or two about misfits. As founder of the Dream Center in Los Angeles, a twenty-four-hour church that ministers to thirty-five thousand hurting people a week, Barnett has seen a little of everything. Gangsters, addicts, orphans, taggers, cutters, the sick, the suffering, the hopeless--all the misfits of the world come through the Dream Center's doors in search of hope. 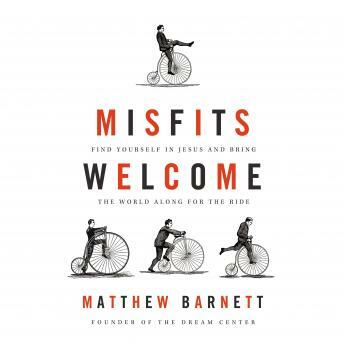 But when Barnett first arrived in LA it was He who felt like the misfit. In Misfits Welcome, he shares the simple, life-changing lesson he has learned from twenty years of ministering to the forgotten: Being a misfit prepares you to do the work of the Lord. Have you found yourself in a jarring new era of life? Have your circumstances deviated drastically from your plans? Maybe you've felt like a misfit all your life, or maybe you're still haunted by yesterday's mistakes. Whatever the case, rejoice! It is at our most broken that you are most ready for what God has in store. Misfits Welcome is not just about embracing the misfits around us--it is about embracing the misfits within us and using them for the glory of god.